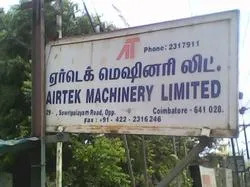 We, Airtek Compressors, established our operations in 1995, as the prominent manufacturer, exporter and supplier of a large collection of air compressors, hydraulic lift and grease pump. We are highly appreciated for offering products that provide optimum functionality and are long lasting. From the very beginning, we have been focused on providing the diverse needs of our clients on time. Our products are highly appreciated for their robustness, strong construction and perfect finishing. Our products find application in industries that include power, oil, medical, electronics, transport and other sectors. We have a world class infrastructure that is set up with all the latest machinery that we require to manufacture our products. Our strong workforce is well experienced and skilled to manufacture products according to the industrial standards and norms. We have all the latest tools and machines set up so as to produce products that offer great functionality and efficient performance. We provide client specific products so as to cater to the exact requirements and offer products of their choice and needs. Because of our endless efforts, we have managed to gather a huge client base. We export our product to Sri-lanka. We are solely Proprietorship Company under the strong motivation and vast experience of Mr. Najumudeen J. We have been able to achieve a remarkable reputation in the industry. Our consistent efforts and strong determination helps us to maintain the superior quality of our product line. We are highly ethical in our business dealings and aim to expand our business while maintaining an impressive track record. We have gained remarkable growth in the industry due to the constant efforts and hard work of our team members. Our company hires experienced and highly qualified people so that we can meet the increasing demands of our clients. The team members understand the requirements of our valuable customers and produce products as per the specifications provided. We regularly conduct training sessions for our personnel to upgrade their skills and knowledge, also our workforce keeps updating itself with the current trends of the market and the latest technologies. We believe in designing and manufacturing world class products for our esteemed customers and this approach has made us a renowned name in the industry today.